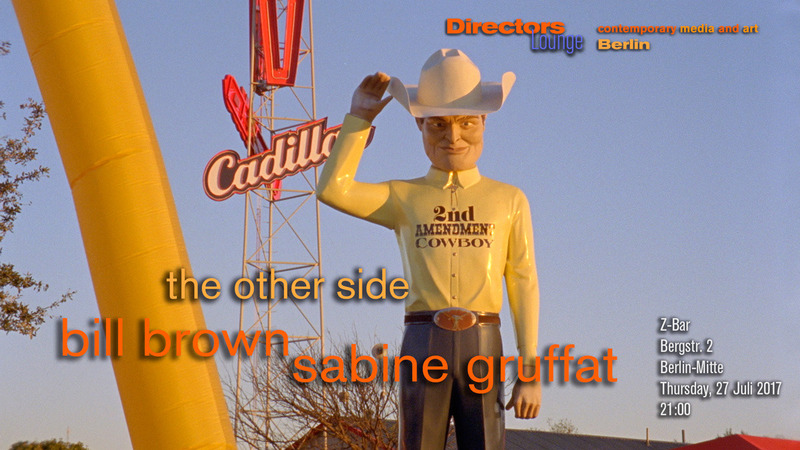 Bill Brown and Sabine Gruffat, artist couple visiting from North Carolina, United States, will present their films. Being a Flaneur, walking to explore the city and the society, exploring modernity and the anachronisms of life on foot does not really make sense in the United States. The equivalence in Northern America would be the road movie: comprising the change of media, change of speed, change of surmounted distances. Bill Brown is one of the filmmakers in the US who hit the road many times to make movies. Born in Lubbock, Texas, he has lived in many cities, Chicago being one of them. His movies, not what you would typically call road movies, have the quality of artistic ethnographic research, or one could also say psycho-geography. “The Other Side 2005” started as a coast to coast trip from Texas to California similar to a trip Brown undertook some years earlier in the United States, along the Canadian border. In the South, the artist was soon confronted with border control, border activism (helping people in trouble trying to cross the border in the desert), abandoned migrant camps and personal stories, walls and fences. When finishing the film, the artist thought, this would be a film about a short term issue, not that it would rise to a political quarrel until now. Bill still narrates the film with the dry humor he used in his earlier film, but the film became intrinsically political, even more so when watching it now, more than 10 years later. 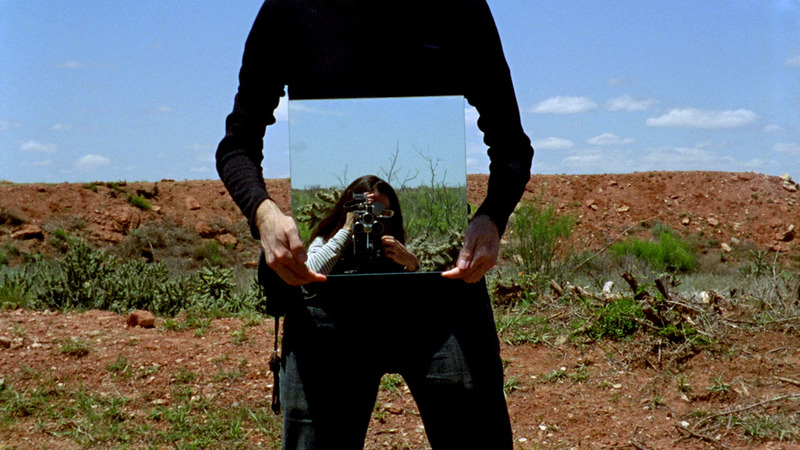 Sabine Gruffat on the other hand is an artist working with two kinds of artistic stance, a rather experimental, almost abstract point of view, and a documentary style, mixed with political demeanor. “A Return to the Return to Reason” is an astonishing remake of Man Ray’s movie from 1923 with means of “art and tech”. Even though it almost looks like hand-knitted, it is made by laser-carving onto real film. A similar kind of hybrid quality between analog and digital also marks “Headlines” which uses animation software to layer and animate newspaper headlines and part of printed articles. Unlike David Gatten, well-known for animating letters on analogue film, the project has a less enigmatic, mysterious quality about the meaning of letters or words, but is a reaction to the discrepancies Sabine found reading the New York Times while living in a remote place in North Carolina. Thinking of an American Flaneurism, the Land Art by Smithson is not that far off. For Smithson, his land art was always connected with some kind of industrial use or man-made landscape. It creates a specific relation not only between landscape and earthwork, but between the work, local people, supporters, land owners, visitors and the art public. For the film project at Amarillo, the artist couple visited the site of Amarillo Ramp many times over 7 years, and at the same time, they undertook a close research to Smithsons ideas and writing. The film explores the surrounding of Amarillo, follows a team of local supporters for restoration on the ramp and finally undertakes a few interventions with the project. It could be seen as a documentary about Smithson, but at the same time also as an art project in tribute to Smithson and his ideas to connect the landscapes and rural areas with the city, ideas which become even more important today, in times of a deeply divided country.